I am a lover of all things quiche. I think I fell in love with Quiche Lorraine many moons ago, although my favorite part of quiche is the savory crust. I did mention before that if I were a dinosaur I would seriously be a CARBosaurus. I LURVE me some carbs, but we all know traditional carbs really aren’t good for the ol’ digestive system. 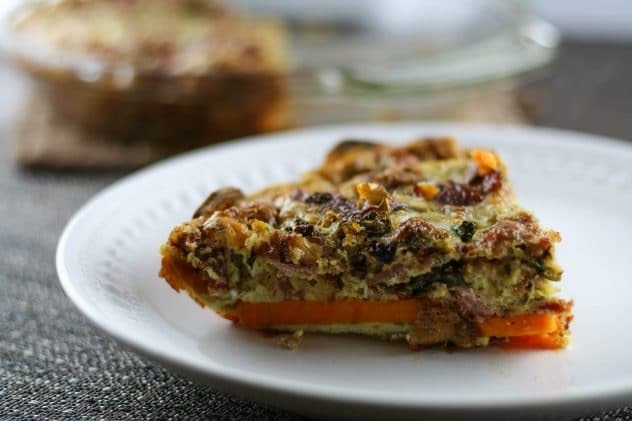 I’ve seen several sweet potato crust alternatives and I always strayed away from them because, who am I kidding, a sweet potato crust cannot possibly replace the savory traditional quiche crust…right?!? Boy was I wrong. I actually avoided making this recipe the other night because I just thought, “eh, it’s not going to be very good.” But I bit the bullet and made it the following night. It did not disappoint. Holy Mamaloney! This. Quiche. Was. Amazing. All jokes aside, you won’t even miss the traditional crust. The combination of the sweet taste from the sweet potato with the salty bacon and sausage plus the sharp brussel sprout flavor makes this combination a knock out. And I’m not even a big brussel sprout fan! One note of warning, do not exceed the coconut oil amount listed in the ingredients. It will spill over when baking and you’ll have a mess on your hands, not that I know anything about this. Peel your sweet potato and slice it thin rounds for the bottom of your crust. For the sides of the crust, slice into semi circles. Grease a 9 inch pie dish with coconut oil. Arrange the sweet potato rounds in the dish to form the crust, overlapping when needed. Arrange semi-circle pieces to form the sides. Brush coconut oil onto the crust and sprinkle with pink Himalayan salt. Roast in the preheated oven for 25-30 minutes, or until potatoes are soft and beginning to brown. As the crust bakes, cook the bacon slices until crisp, drain on paper towel or napkin and set aside, reserving the grease in the pan for the remaining ingredients. Using the bacon grease, add in the chopped brussel sprouts and onion and cook until softened. When the sausage is fully cooked, remove the pan from heat, crumble the cooked bacon and add to the skillet. Stir to combine and set aside. In a large bowl, whisk together the eggs, coconut milk, salt, pepper, and garlic powder. Remove the sweet potato crust from the oven once it has finished baking and add in the brussel sprouts mixture. Next, carefully pour the egg mixture over the brussels sprouts mixture. Use a spatula to spread the mixture evenly throughout the pan. 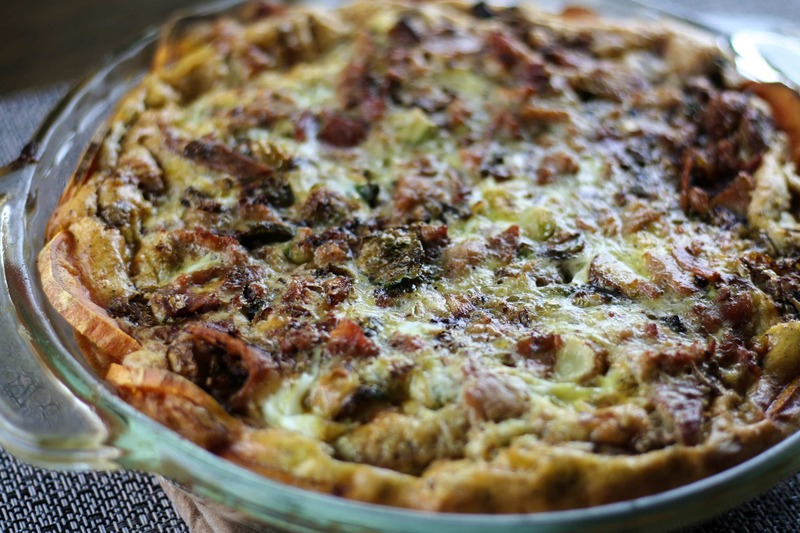 Lower the oven temperature to 375 degrees, and bake the quiche for about 25 minutes, until the middle has just set. 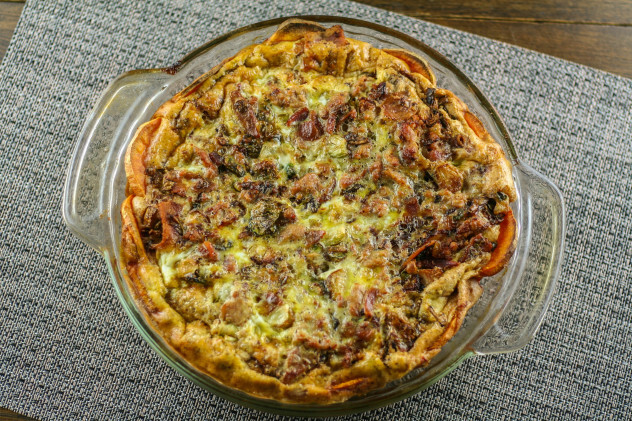 Carefully remove from oven and let the quiche sit for at least 10-15 minutes before slicing to serve. 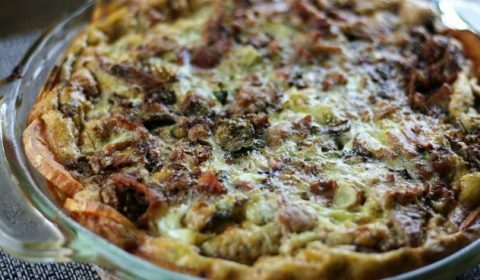 Note: there may be extra coconut oil on top of the quiche so remove carefully from the oven to avoid any spills or burns.